Don’t hate us for being Beyoncé and Blue Ivy. I didn’t want to even write about this, because it felt so First World privileged and braggy (which it totally is). 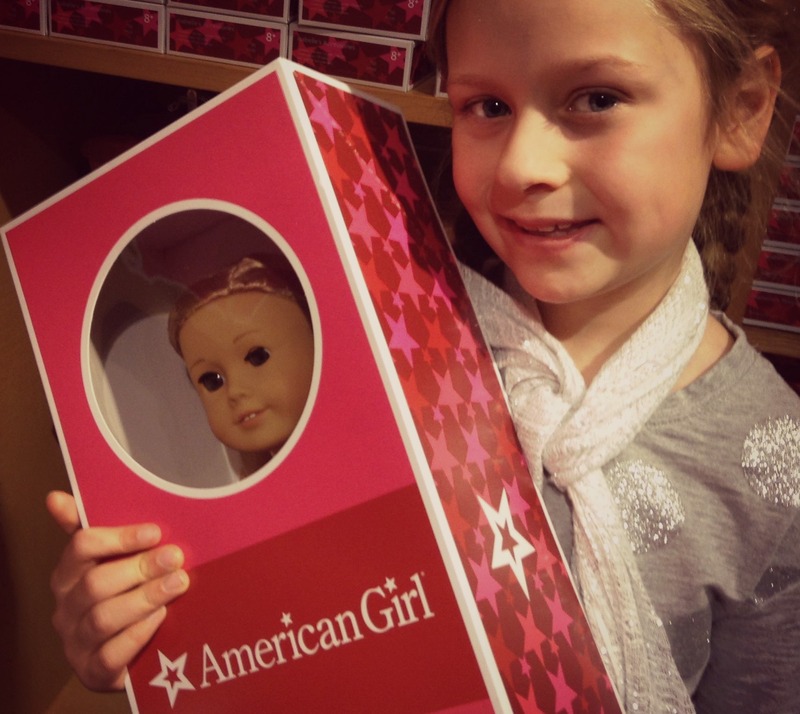 But yes, Virginia, there is an American Girl Doll store (actually, there are 20). And yes, my girl and I spent four+ hours in one last month, ringing in her 9th birthday. And ohhh yes, we dropped more coin on a silly doll and her bedazzled duds than I spend on my shabby chic wardrobe in a year (which is a sad sad commentary on the contents of my closet). Yes, we sipped pink lemonade with our pinky fingers in the air and nibbled tea sandwiches with “Isabelle” perched upon her tiny pink throne. But let me just own it right now: I loved every minute of it. And It was worth every red cent I could rub together. It was all so adorably INNOCENT. 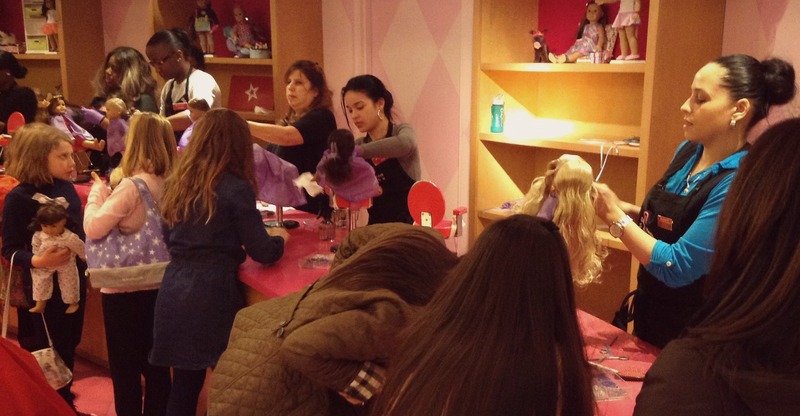 In a world of too-much-too-soon for girls where I’m constantly shielding Lucy’s eyes or clamping shut her ears, this place was a throw-back to when little girls could be little girls…not mini-Ke$sha’s-in-training. In that girlie alternative universe, it was cool to clutch a doll in your arms and love it unabashedly. It was the thing to do to brush that doll’s hair til it gleamed, because it was precious to you. It was okay — better yet, it was enviable — to still be a little girl. “Pause” on growing up. On boys. On Katy Perry. On not believing in Santa. On knowing all the bad words and how to use them. 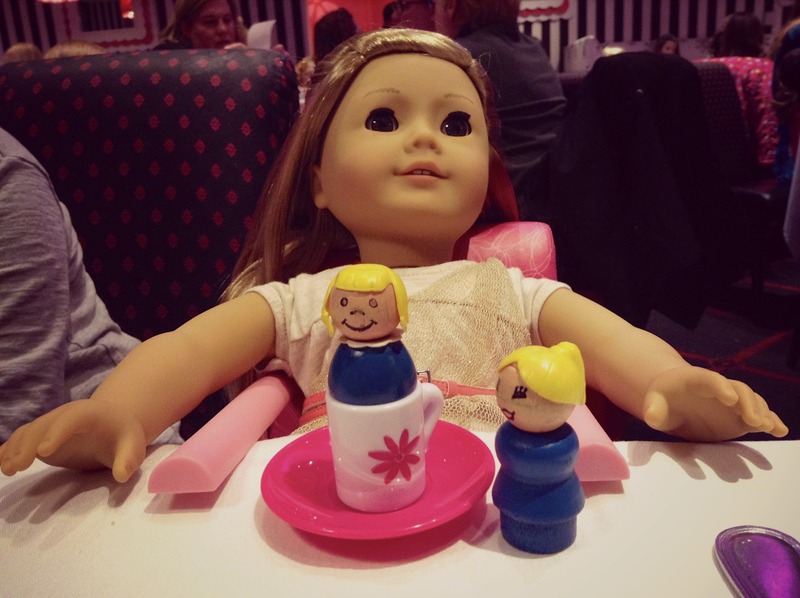 On outgrowing dolls…and maybe, one day, me. Heaven knows, I would happily open my wallet up wide if I could buy myself some extra time with this little girl as a little girl. I’m not sure it works that way, but oh man, I gave it the college try. After hours of dawdling and foot-dragging, it was time to move on. The world awaited outside — and pretty much everyone in that world was in Times Square. There we felt the wind brace our faces and the lights dazzle our eyes — and there the sight of Naked Cowboy’s Fruit-of-the-Loomed haunches greeted us with a taut smile. Nearby, we spotted two Naked Cowgirl friends sporting their most immodest painted-on pasties. Ah, I remember now….this is the world we’d escaped for a few hours. I’d forgotten. Ick. 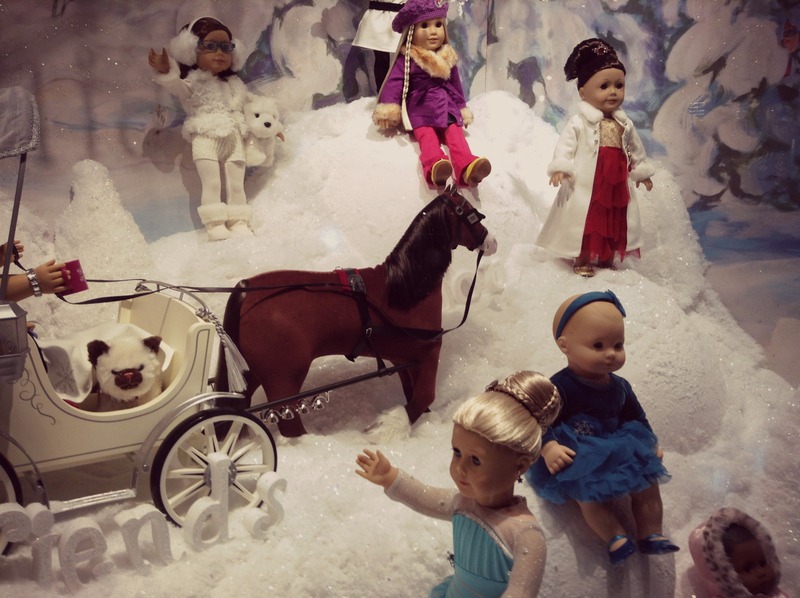 I was ready to spin on my heel and hurl myself through those revolving doors again — back into a world of make-believe and $300 horse-drawn carriages for dolls — and spend the night in a doll teepee. Instead, we giggled and pretended not to look and kept on trucking. 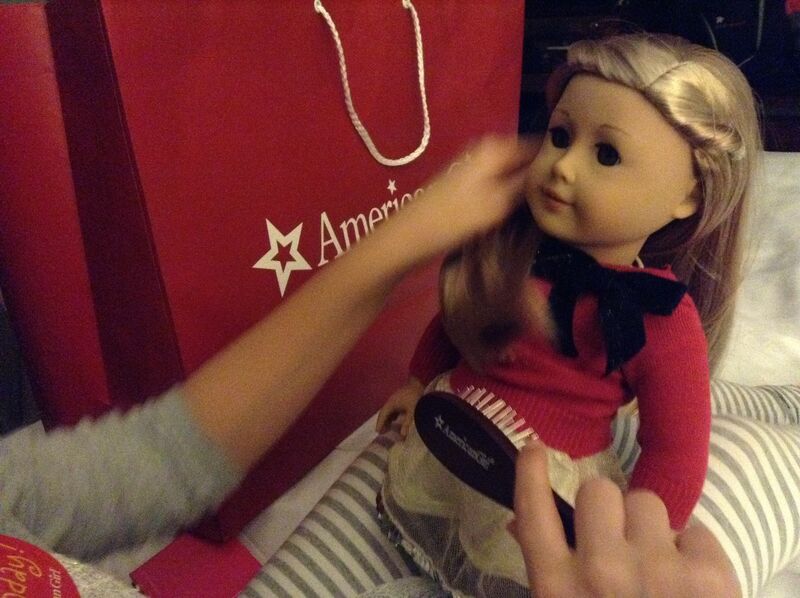 And like an OCD case study, Lucy kept brushing her doll’s hair to a high sheen. I guess that’s the plan from here on. Keep laughing and keep moving past all that mess – to whatever the future holds – together. I'm all about mining the day-to-day insanity of family life for laughs...and even occasionally for meaning. Nora Ephron said when you slip on a banana peel, people laugh at you. But when you tell people you slipped on a banana peel, it's YOUR laugh. There is much slipping on family banana peels here. Enjoy a good laugh at our expense. Order Now! Click Cover & Go! Join the Crib Crowd! Get an e-mail when I post new stuff. Quick, Elaine! To the Archives!